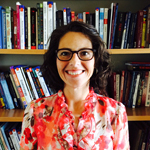 Dr. Michele Quiñones teaches criminology, research methods, and ethics at the undergraduate and graduate level. Dr. Quinones is passionate about equality and social justice. She has hosted discussions on the effect of race in education and criminal justice and been an invited speaker on topics such as indigent defense and human trafficking. Her research focuses on the effects of race and ethnicity in the criminal justice system and racial profiling. Dr. Quiñones’ research earned an award and is currently featured in a prominent research methods text book. Dr. Quinones earned a BA in Anthropology at UT-Austin, and an MA and PhD in Criminal Justice at Texas State University. Before returning to school, Dr. Quinones worked for several police departments in community relations and as an interpreter.